Road Trip is back! Our weekend schedule has been crazy busy (and fun!) for the past weeks so we never really had time to explore and visit parks for our usual early morning or afternoon walks. For the past two months, we were only able to go to University of the Philippines two or three times. For those who are new to this blog, every Thursday I feature parks, museums, gardens or facilities for the family that we have been to. I sometimes share our family activities, too. Read my Road Trip posts here. Anyway, back to our road trip two Sundays ago. Despite my dad's "Watch your things!" and "Don't let Julia be out of your sight even for a second!" warnings, we braved Manila and visited the historic Luneta Park. It was not our first time but the last time we were there, Julia was less than a year old so it was a manageable situation. With a very energetic toddler, our visit to one of the Philippines' major tourist attraction will definitely be a challenge. Our game plan was: Don is in-charge of Julia, I am tasked to take care of our things. Trivia: Right in front of the Rizal Monument is the 0km Post, the spot from where distances in the Philippines are measured. Check here for more info about Luneta. 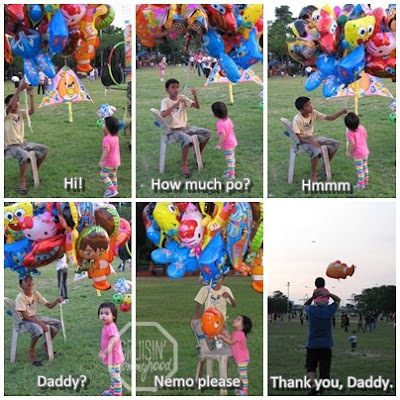 After taking photos, we decided to cross the street and stay at the Quirino Grandstand so that Julia can run and play with her hula hoop and ball. The sun started to set and we decided to go back to the park area. We saw lights coming from the Central Lagoon area so we decided to check it out. 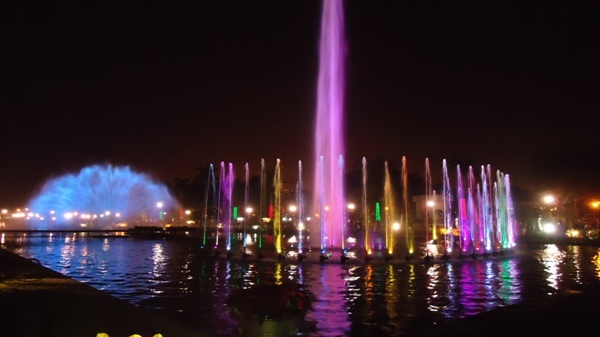 The Luneta Dancing Fountain! It was fun to watch, very entertaining. The photos I took were such a disaster, so I grabbed this photo from the web instead. More photos and directions from Directions on Web.